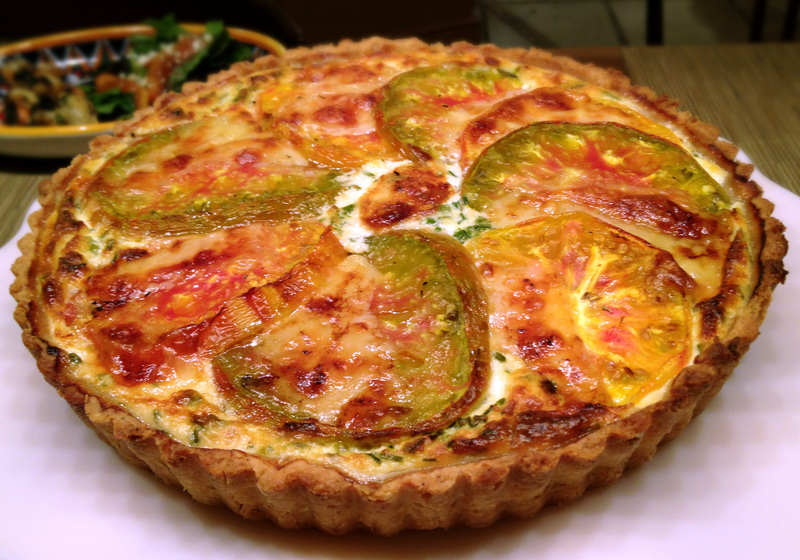 It must be serendipity: last year, I posted a tomato tart recipe to celebrate the one-year anniversary of my blog, and this year, without even planning to do so, I have another tomato tart recipe! …Or maybe September is tomato season, and I’m deeply unoriginal. Well, it’s a certainly at least a little comforting that despite the difficulties of the past year, there are parts of me that remain unchanged. I still love tomatoes, I still adore pastries and butter and learning to cook, and I am still writing about it all. It’s been two years of discovering that my love for food extends beyond desserts and sweets, and that I may not be as useless in the kitchen as I first thought. Two years of learning family recipes from my dad, exploring new cuisines, gaining confidence with each success, and learning from failures. Well this is a horribly cliché post, but honestly, I (and everyone else I know) never thought Kitchen Whimsies would make it past its first year. In ancient times, if a baby lived past two years old, parents could begin to believe that their child might actually make it to adulthood, or at least adolescence. I don’t know how to measure the lifespan of a blog – in dog years? In blog years? – but hey, what matters is that somehow, we’re still alive.